Tsawwassen Mills recently opened in our region. The retail space of this mall is slightly smaller than Guildford Town Centre. Tsawwassen Mills uses more land because it is not multi-story and doesn’t have structured parking like Guildford Town Centre. It also has about 1,000 more parking spaces (6,000 in total) than Guildford Town Centre. Tsawwassen Commons, a power centre that would feel right at home along the Langley Bypass, will be opening up just north of Tsawwassen Mills shortly. An artist's drawing of the actual land use of the "mixed-use" area of TFN lands. Select image to enlarge. Most of the malls in our region were developed on former agricultural land. In Langley City, it was no different. Our power centres and Willowbrook Mall were farmland at one point. 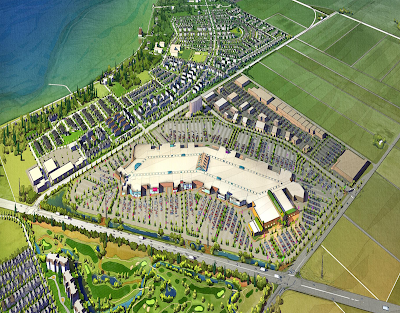 When looking at projects like Tsawwassen Mills and Tsawwassen Commons, it is the rapid and massive conversion of farmland to auto-oriented retail that has caused alarm for people. Rapid urbanization of farmland was one of the reasons why the Agricultural Land Reserve was created it in the first place. 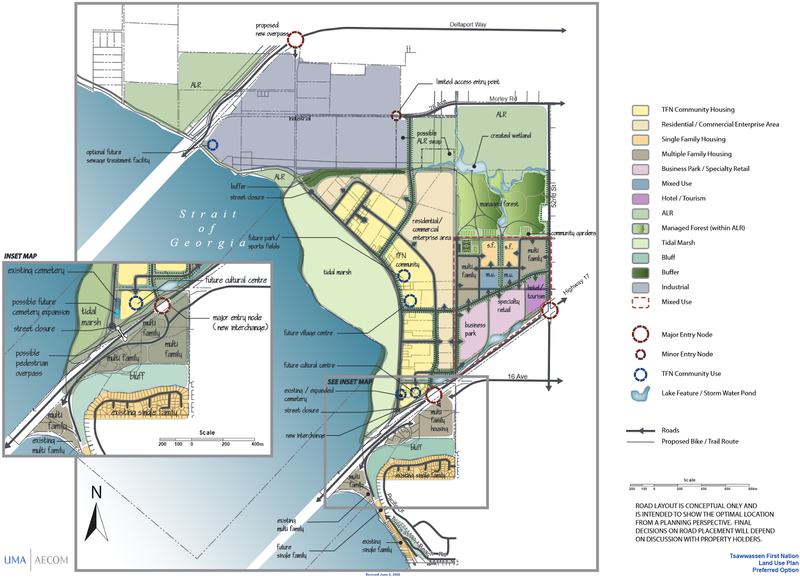 Tsawwassen First Nations (TFN) has a land-use plan. It is really interesting to see the original plan for the lands that are now the location of Tsawwassen Mills and Tsawwassen Commons. TFN Land Use Map. Select map to enlarge. 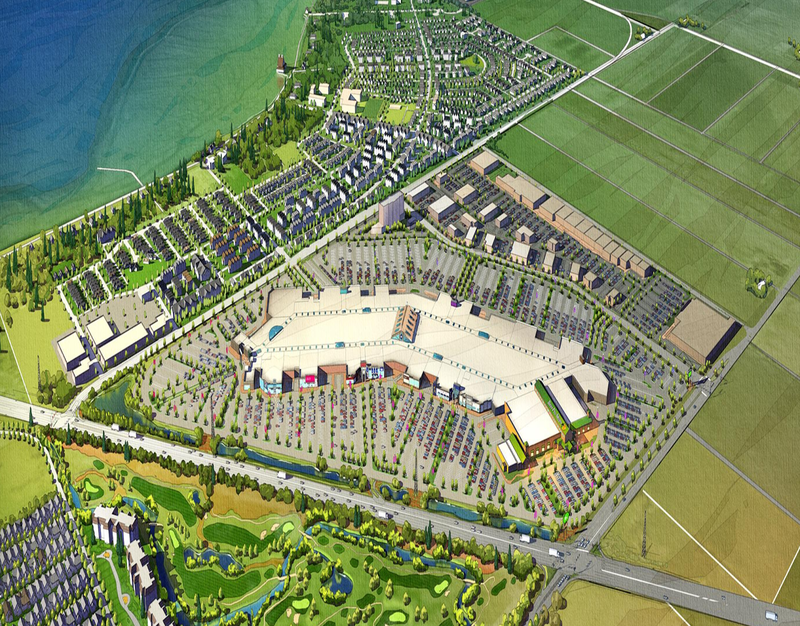 Under the TFN plan, Tsawwassen Mills and Tsawwassen Commons are in a mixed-use area. According to the land-use plan, this area can include “hotel, retail and business park uses. A mixed use community is planned with single family, town home and apartment style housing”. Now this land use plan likely would have taken decades to fully build out. A project like Tsawwassen Mills took less time to build, meaning it would be delivering economic benefit to the TFN almost immediately. Even in Langley City, development projects have been approved that are questionably in the spirit of our official community plan. Many people believe that having something is better than a brownfield or vacant site. I’m not a fan of auto-orient retail, but I can certainly see why TFN made the decision they did. This is why having a regional growth strategy and the ALR is so important. It creates a tension which balances the social, economic, and environmental priorities of our region as a whole.